Rachel Chu is mostly excited but a little nervous when her boyfriend, Nicholas Young, invites her to spend the summer with him and his family in Singapore. She thinks Nicholas might be The One, so it’s only natural to want his family to get to know her and vice versa. What she doesn’t know is that Nicholas comes from one of the wealthiest families in Singapore, he’s heir to a huge fortune, and his family is not going to accept him marrying an ABC (American Born Chinese). As Rachel gets to know the insanely rich family and friends that her boyfriend grew up with, she begins to question her place in his life – and wonders if she can ever fit in at all. Can I start really quickly with a short discussion on the term “chick lit”? I am just going to put it out there that if Crazy Rich Asians was written by a woman, it would be deemed “chick lit” and therefore been brushed aside as too fluffy or silly by many readers (and critics). But since a man wrote this book, it’s funny and smart satire. Think about that for a second. Anyway. The above comment does not mean I didn’t like the book – in fact, I REALLY liked the book. Crazy Rich Asians IS funny. It’s hysterical at times but also in the way that you know the things happening here are kind of true – satire is based in reality, of course. As I read the first fifty pages, I worried that I would have trouble keeping all of the characters straight – there are a lot of people in this book, and they’re all related somehow – but that didn’t end up being an issue. And I think the many characters contributed to my enjoyment of the book, because just at the exact moment I would start to be less enamored by a character and more annoyed, Kwan would switch to someone else. Although I have to admit that I’m not one hundred percent sure I have the family tree down in my brain – this cousin married so-and-so’s niece’s son, etc. Very confusing. But it was much less important to keep their relationships straight as it was to just know who was who and how they were related to Nick. While the novel is really funny and is supposed to have that light tone throughout, there is a serious element to it and I was glad for that. I think without the depth the end of the novel brought, I would have liked the book a lot less. As it is, though, I thought the ending gave the novel the punch of reality it needed and absolutely gave me a reason to want to read the second book, which was just published the other day. So I really liked Crazy Rich Asians!! While this wasn’t the kind of book I would have picked up on my own, the combination of great reviews I’d seen for the book and my friend’s urging helped me decide to read it. 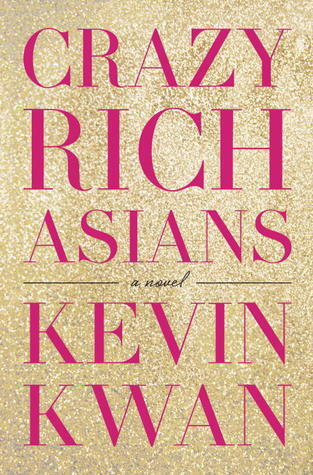 I can absolutely recommend Crazy Rich Asians and I really did have a lot of fun reading this novel. Your review is fantastic. You’ve made the book sound great and you’ve made me think about genre labels. This does sound interesting and good to know I don’t have to keep all the intricacies of all the relationships straight. I like the point you make about the chick lit label. There’s so many great books that I think get ignored or dismissed simply because of a label or an author. I was thinking exactly that the other day when I read the first few pages of Crazy Rich Asians. I enjoyed it, and I’m going to keep reading it, but omg, yes, it would be categorized as nothing but chick lit if a lady had written it. Stupid world. Now I want to read this. You made it sound so good. “Can I start really quickly with a short discussion on the term “chick lit”? I am just going to put it out there that if Crazy Rich Asians was written by a woman, it would be deemed “chick lit” and therefore been brushed aside as too fluffy or silly by many readers (and critics). But since a man wrote this book, it’s funny and smart satire. Think about that for a second.” – This is really an interesting point. When women write this kind of thing, it is all too easy to slap that label onto it without giving it credit for higher level of writing and the gravitas.